HIS HEART WAS MOVED WITH PITY FOR THEM, FOR THEY WERE LIKE SHEEP WITHOUT A SHEPHERD. This Sunday's scripture readings are all about shepherds - good ones and bad ones. God promised that he himself will shepherd his people Israel and raise up an heir to the throne of David who will reign as a righteous king. In our first reading (Jeremiah 23:1-6), the prophet chastised the weak and sinful kings (shepherds) of his day for scattering their flocks and then speaks on behalf of God as he promises a righteous shoot from David will reign as king and Israel shall dwell in security. This messianic prophesy is fulfilled by Jesus as we will hear in today's Gospel. 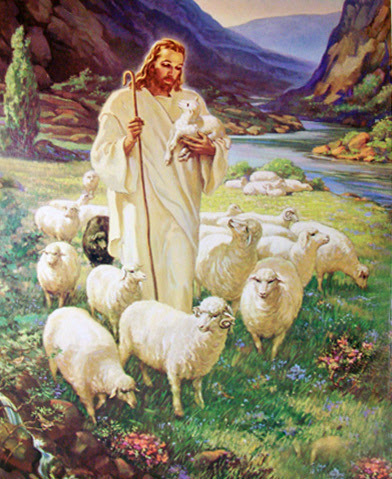 Woe to the shepherds who mislead and scatter the flock of my pasture, says the LORD. Therefore, thus says the LORD, the God of Israel, against the shepherds who shepherd my people: You have scattered my sheep and driven them away. You have not cared for them, but I will take care to punish your evil deeds. I myself will gather the remnant of my flock from all the lands to which I have driven them and bring them back to their meadow; there they shall increase and multiply. I will appoint shepherds for them who will shepherd them so that they need no longer fear and tremble; and none shall be missing, says the LORD. Behold, the days are coming, says the LORD, when I will raise up a righteous shoot to David; as king he shall reign and govern wisely, he shall do what is just and right in the land. In his days Judah shall be saved, Israel shall dwell in security. This is the name they give him: "The LORD our justice." In our Gospel reading (Mark 6:30-34), the twelve apostles return from their mission elated but exhausted (see last Sunday's Gospel). Jesus takes them to a deserted place to rest but the crowd follows. Jesus reveals himself as the faithful shepherd of the new Israel as he is moved with pity for them. He began to teach them many things. In the next passage that follows this, Jesus will feed the five thousand with just five loaves and two fish. In our Epistle reading (Ephesians 2:13-18), St. Paul tells the Gentile Ephesian community that through the blood of Christ, the dividing wall has been broken down. They and the Jews have been united into one people; just as God had promised in our first reading, God has "gathered the remnant of his flock". Again, lest we think that this talk about shepherds of old does not concern us, we should keep in mind that we are all shepherds in some way - either for our family, our friends, or those in our care or charge. We are blessed to have the apostles and Jesus himself as our models. May we live up to our calling.